Alpaca fibre is getting renewed attention and more people are discovering the long known advantages and pleasures of using alpaca to make clothing. For the Inca’s of South America alpaca was so special that wearing it was reserved for the elites. Today, alpaca fibre is gaining ground as an ideal natural material for sustainably produced clothes that are a step away from confection clothing that use unsustainable production methods and materials. The alpaca is a domesticated species of South American camelid. They are related to the vicuña in the genus Vicugna. Alpacas are fully domesticated and have been kept for their fleece for thousands of years. 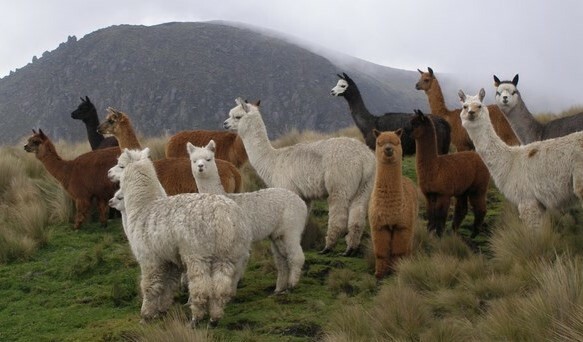 In Bolivia, where the fibre for Wild Wawa clothing comes from, alpacas live in free-roaming herds of sometimes hundreds of animals on the high plains (the Altiplano) of the Andes. Alpacas are sheered once a year. It is necessary to sheer them and the animals experience very little stress from it. The herding and shearing of alpacas is animal friendly. Alpaca fibre is light and hollow which gives it excellent thermal properties and makes it ideal for clothing to wear all year round. The elasticity of the fibre makes it strong and durable. Because the fibre has a smooth surface, it feels soft and luxurious and doesn’t cause irritation to our skin. Alpaca is hypoallergenic because it contains only minute amounts of lanoline, at levels below the values that cause allergic reactions. Wild Wawa only uses yarn made from the finest alpaca fibres; the so-called baby alpaca and superfine alpaca fibres with a diameter between 21 and 25.5 micrometre. Baby alpaca does not come from baby alpacas; it is just a name for the finest of the finest alpaca fibre. Alpacas come in a wide variety of colours and there are more than twenty natural coloured yarns. Have a look at our natural colours collection to see all our products using just yarn in natural alpaca shades.